Once upon a time, the township of Mt Hagen was considered as one of the beautiful towns in PNG. Sadly, that is history as we speak. The now Mt Hagen City has turned into a pigsty. The streets are adorned with rubbish. Pocket pickers, rascals, drunkards, and the like riddle the streets and disturb city dwellers, locals and the general public. The informal sector has seen a rapid growth in the last 2years and is slowly but steadily outnumbering business by local farmers and business houses who have contributed largely to the city's initial development. Tribes living on the outskirts of the city, Jigas, Moges, and the like (once owners of the land upon which the city was built) have been grabbing the land acquired by the State from their forefathers and have set up mini structures (illegally on State land) to conduct business. Amidst all this, the sale of pigs in town has become a norm. It is now a major commercial activity! Half of the multi-million kina market facility funded and donated by Aus-Aid has been occupied by marijuana and home-brew sellers. As if that's not enough, the market management now dumps their rubbish just outside the market gates onto the conjoining streets. Now, who should be blamed for all these? As absurd as it may sound, the judge is actually responsible for this. Unfamiliar for the headlines he is, but his subtle inaction in adjudicating and resolving disputes has seen the demise of a once cohesive society where laws were respected, and order was maintained. He is the resident judge of Mount Hagen and is sitting on more than 37 court decisions dating back years. Some of these decisions are very very simple applications that would take less than 30 minutes to determine but has taken him ages. When the formal judicial system fails to resolve a dispute and administer justice, anarchy brews, and this is exactly what is looming as I am jotting these notes. 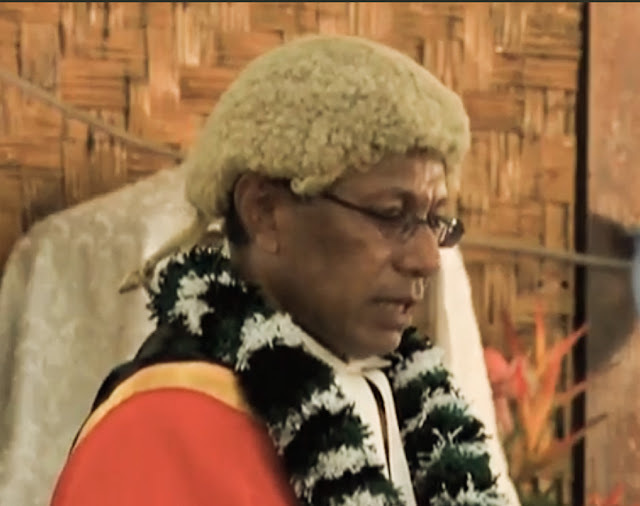 Amongst the impending decisions, there is an outstanding decision yet to be handed down by the judge in a proceedings in which the newly created Mt Hagen City Authority and the old creature Mt Hagen Local Level Government have taken to invoke the judiciary's function to interpret their respective functions and draw a clear demarcation on their respective roles. It has been almost 4years since the matter was heard by the judge and reserved for a ruling. The delay has costed the well-being of the people of Western Highlands and the surrounding highlands provinces who commute daily to access services in the city. The Mt Hagen City Authority, created by the National Executive Council as the city's municipal authority, remains unfunded because of the National Government's reluctance to allocate funds for the running and operation of the Authority. This is also a result of the pending decision by the judge. Along with the judge, are Open Member and the Governor responsible for the province. Their politics has ended up in exchange of fists in the parliament. They have pushed two bodies to run the province and city and now we have those bodies fighting in court but the judge is sitting on it. As a result, no regulatory body is responsible for fixing this issue and a decision from the judge seems far-fetched. On top of the case above, more than 37 cases are pending rulings and decision as a result of the judge's delay in handing down rulings. One of the cases involves two major surrounding tribes dispute over a prime land in town. The delay has raised suspicion and one of the parties has threatened to burn the courthouse. Frustrations may lead to another courthouse being burnt. Now that the Mendi National Courthouse has been burnt, the situation may get worse. Attempts to reach the judge and lawyers for parties have failed as lawyers have advised that they are only waiting for the judge to hand down a ruling. The Plaintiff, in that case, the former City Manager died while waiting for the ruling after completion of the case in 2015. One wonders whether Justice Kenneth Frank is simply incompetent or was corrupted. JUSTICE DELAYED IS JUSTICE DENIED. Please free to leave comments.